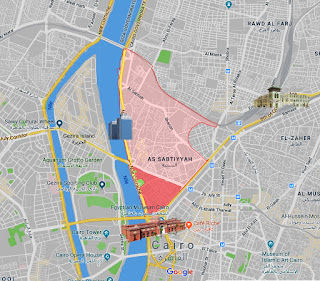 Metropolitan Cairo is divided into some seventy districts. Getting around the city in a taxi frequently entails naming a district and then proceeding. Ask to be taken to Maadi or Shubra and you are largely done with the instructions. 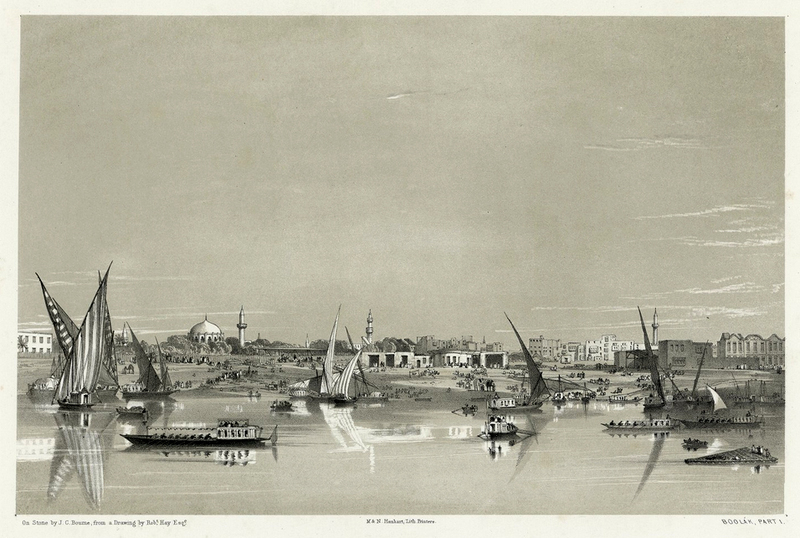 One quite large and well known district is Bulaq. 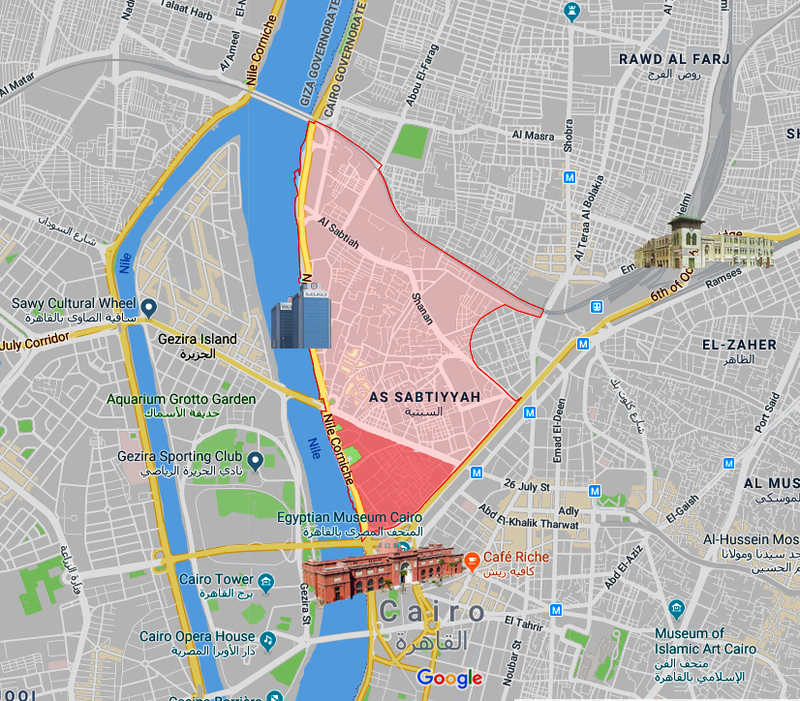 It occupies a triangle with one side on the eastern bank of the Nile and extends to the North from just beyond the Egyptian National Museum well beyond the distinctive blue towers of the Egyptian National Bank. To the east, the district reaches most of the way toward the central train station. 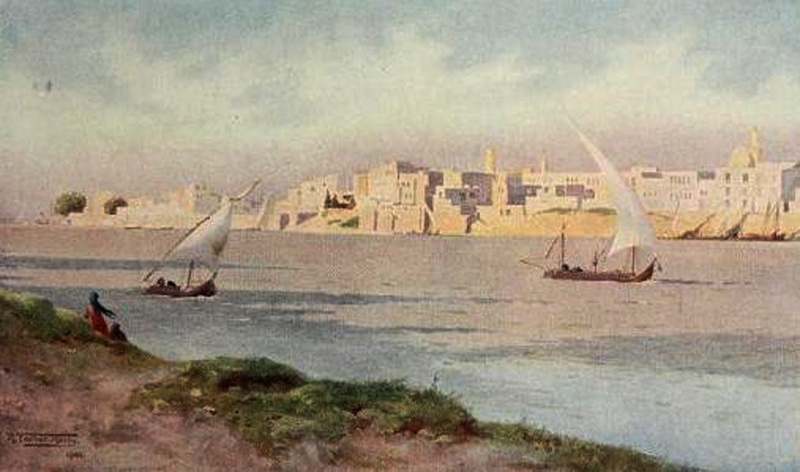 Bulaq was once a separate village and was the port of Cairo. A favorite with artists, it turns up regularly in paintings and travel guides from the nineteenth and early twentieth centuries. This sketch is from the 1840 Illustrations of Cairo by Robert Hay which can be viewed online here. Note the Mosque of Sinan Pasha in the background on the left - we are going to encounter it again. And this painting is from the 1906 book: Egypt, Painted and Described, by R. Talbot Kelly which can be downloaded here. 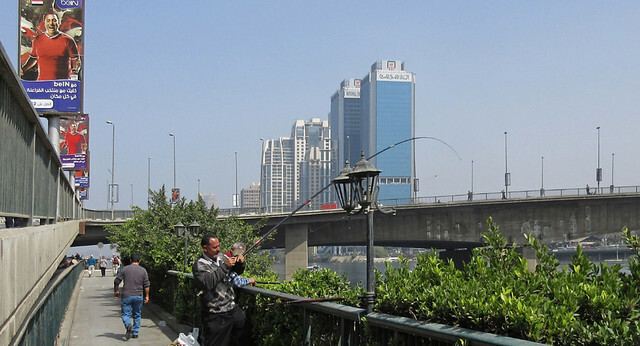 The section of Bulaq along the Nile has now given way to modern new high-rise construction. The blue towers of the Egyptian National Bank stand out as a prominent landmark visible on both sides of the river. Back from the river, however, the architecture and landscape might best be described as colorful old Cairo. Over centuries, the district grew haphazardly and became dominated by tight alleyways, lanes, crowded tenements and Islamic architecture and filled with enormous workshops of small-scale industries. 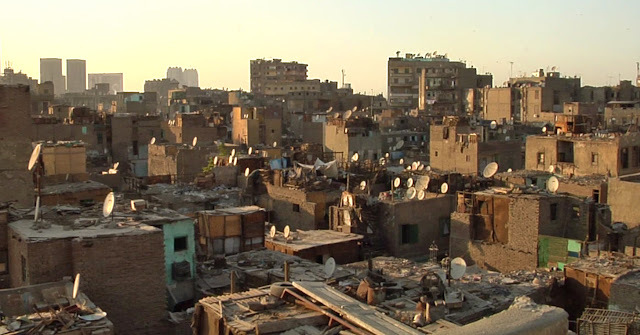 It is populated by a mixed working class from all parts of Egypt, who migrated to the city during the 19th century to work on Muhammad 'Ali' Pasha's modernization projects. To the north of the district is located the bulk of the city's newer industrial plants. The district is filled with outstanding Mamluk and Ottoman mosques and merchants' houses located near the port. Well, the planners and government have finally overcome their reluctance and begun a major renewal of the area marked in dark pink on the map at the top of this post. I wish that we had known this was going to happen so could have taken some good "before pictures" last year. Lacking that, I encourage watching this twenty-six minute video about Bulaq. As close as I can come to a "before" picture is to show you a "screen capture" from the video. After watching the video, I was ready to move to Bulaq. However, Linda and I talked to a "beat cop" in the area, a former downtown shop owner who ate lunch there during the 1980's and 1990's and a recently displaced resident. Nostalgia aside, the neighborhood had become pretty much unlivable. Here is a panorama shot of that dark pink area as it looks today with the buildings demolished. The small black figure seated on a cement chunk in the right third of the photo is a displaced resident looking wistfully at a pile of stones that marks the area where she grew up and raised her children. She said she likes to come here often and remember her life as it was. The government has given all residents some compensation for their businesses and homes but not nearly enough to remove the pain of leaving the area where they lived and worked all their lives. (Linda's note:) I once accidentally wandered into this labyrinth of close set buildings and couldn't find my way out. 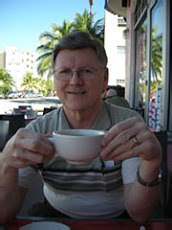 Since I was a foreigner in a place where foreigners were seldom seen, I attracted a fair amount of attention. The residents waved and greeted me in Arabic and were so friendly that I decided to enjoy being lost as I meandered about until finally making my way out of the area.